A fully customizable homepage: Peddlar provides you with every module you might need to have on a store website. Each module comes bundled with it’s own widget, which can be customised above the blog posts on your homepage. 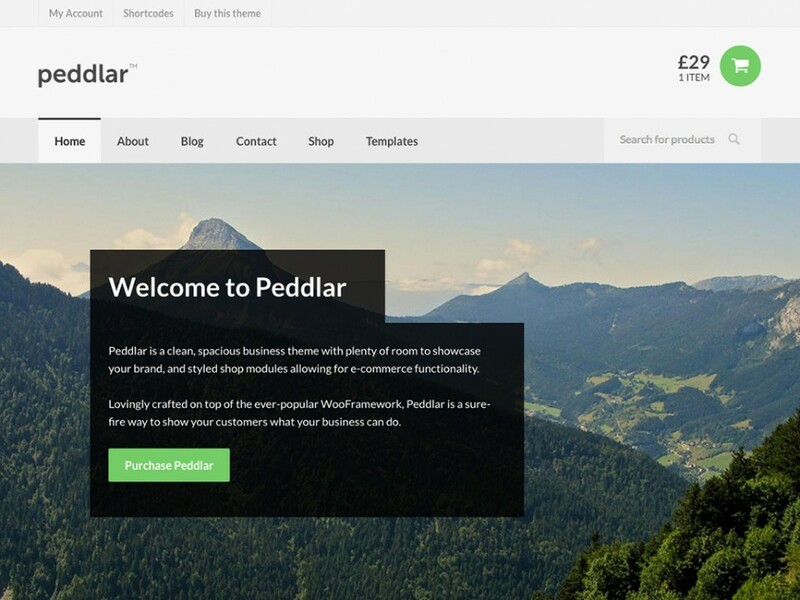 Featured slider: Peddlar has an optional featured slider module for the homepage, as well as WooSlider support for the business landing page. It’s also possible to include a video in the homepage slider, along with a background image on each video slide. Powered by it’s own custom post type you can feature just about any text, images or videos you’d desire in this key piece of homepage real-estate. Call To Action Bar: Peddlar’s homepage includes a call to action bar for helping your customers in the right direction. Catalog-Focussed: Peddlar is focussed on helping your customers view your product catalog in a clean and open layout. There is plenty of open space to ensure your content and products are the main focus for your customer. “Business” Page Template: Are you looking for an alternate homepage? Use the “Business” page template as your homepage for an alternate homepage layout. Integrates with our WooSlider, Features and Testimonials plugins, as well as your blog posts and page content to display a unique and attractive alternate layout.